One of the challenges of shopping for medical equipment is that you can’t just walk into a store, see all of your options and try them out. It frequently comes down to what your therapists and DME providers recommend. That speaks to the importance of having a knowledgable and trustworthy team, as I do. It’s important to keep in mind that it’s not about which bed is best, but rather which bed is most appropriate. Kids have different needs. Aidan has a Sleep Safe Bed because it’s most appropriate for him. There were three factors that were most important in choosing Aidan’s bed. 1. It needed solid safety rails all the way around. Because he doesn’t have great control of his body, there are spaces in a typical hospital bed that Aidan could (and did) fall through. 2. It needed to move up and down. When it’s low, Aidan can get into bed. Then we can raise it for changing and dressing him so we’re not breaking our backs. 3. Because we will move the height daily, it needed to be electric. None of this turning a crank business. 4. As a bonus, Aidan’s bed is full sized. I realize that seems like a bit of a luxury, and it sort of it. However, during Aidan’s surgery recovery process, we had to be so gentle when we moved him and it was all very awkward. We needed morespace, and with another surgery in his future we will have it. This bed will also keep him comfortable as an adult. In our search we found some other beds that may be more appropriate for other kids. I’m including them here. I have no experience with them, but found the websites to be very informative. 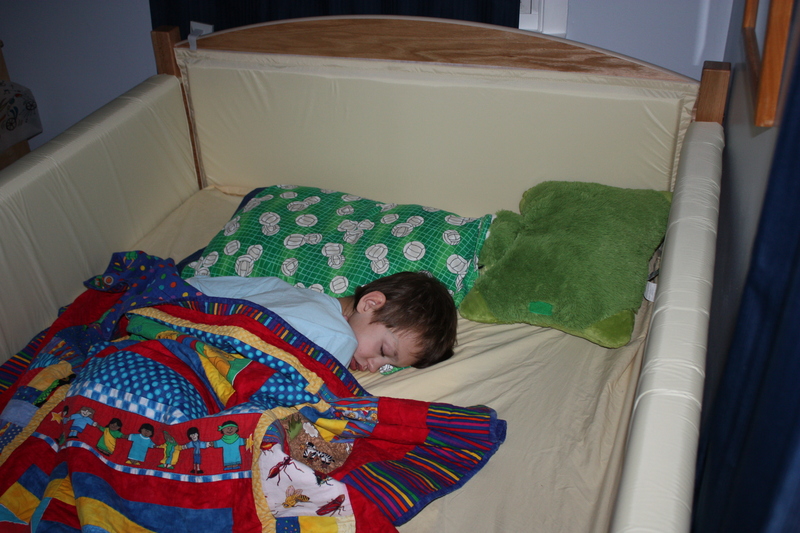 Consider your possible need for seizure padding (Aidan has it), an IV pole, or a covered canopy. 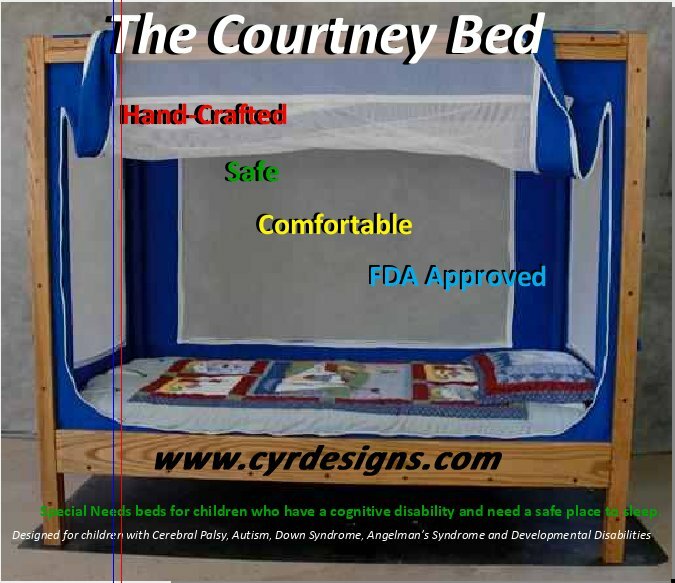 While The Courtney Bed would not be strong enough to contain Aidan, it seems more appropriate for a child who has better control of his/her body but would be in danger when s/he wanders off. Beds by George is most similar to Aidan’s Sleep Safe Bed. It had a heftier price tag and the full size was not electric. It’s beautiful, though, isn’t it? Kayserbetten Beds have doors that open to the side rather than a rail that folds down. While I’m not entirely sure of the benefit of that, I think it’s pretty cool. I didn’t get a quote, mostly because I had a strong emotional reaction to the look of it. I had a great conversation with Jeremy Lucas at the Pine Tree Society. He and some volunteers build specialized beds. They work with you and your team to give you exactly what you need. Because this is a volunteer project, they’re able to keep the cost down. This would be my first recommendation to anyone gathering information. Unfortunately, they only work with beds at a fixed height. I hope this helps you in your research. While we LOVE Aidan’s Sleep Safe bed, it’s because it’s most appropriate for him. It may not be exactly what you need for your child. Wow, there really are so many things for you to consider aren’t there. And I thought choosing a nursery for my 3 yr old was tough !